We’ve seen a flurry of jailbreak tweaks surface over the last few days, and it doesn’t look like it’s slowing down. Multiple packages turned up in Cydia today, but the one we’re going to cover in this post is IconCommands. IconCommands doesn’t tie in with Activator the way Apptivator does. There are 6 pre-programmed actions that can be activated by an icon tap (or taps): App Info, Add Icon to Photo Library, Delete, Hide, Set Jiggling, and Launch Icon. The cool thing is, you can program a function for up to 8 taps. So if you wanted to be able to delete an app by tapping its icon 7 times, you could. 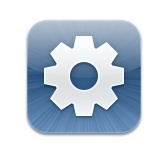 I’ll be honest though, tapping an icon gets tedious after 4 times, so the utility really could have stopped there. 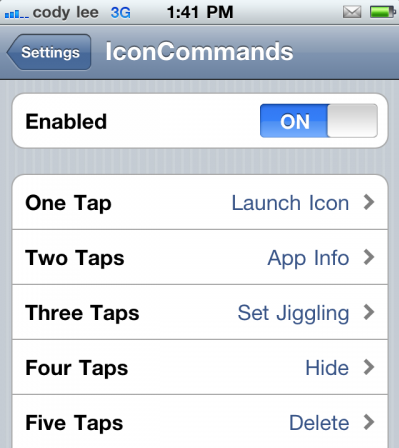 Actions are set from the IconCommands tab in the Settings app, and changes reflect quickly without needing to respring. It’s also important to know that programmed functions apply to every app icon, so you can’t have different settings for different applications. All together the tweak works very well, and if you find yourself frequently hiding and deleting apps, it could definitely save you some time. If you want to check out IconCommands for yourself, it’s available in Cydia for $1.99. Have you tried IconCommands yet?